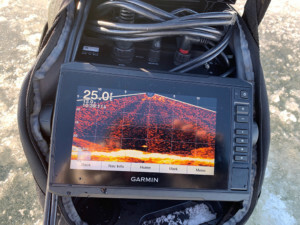 Garmin’s Panoptix ice bundle has been a hot product in the ice market this winter as it offers a powerful combination of sonar technology and high-def mapping. The unit comes with a traditional ice fishing transducer with float and an adjustable narrow beam angle (8 to 16 degrees) for great target separation when viewed as a flasher or traditional LCD display. It also comes with Garmin’s LakeVü mapping, offering 1-foot bottom contour on over 17,000 waters nationwide. But most anglers are buying the unit for Panoptix with its twin modes: LiveVü Forward and LiveVü Down. Panoptix LiveVü Forward searches horizontally from surface to bottom out to 100 feet in any direction. 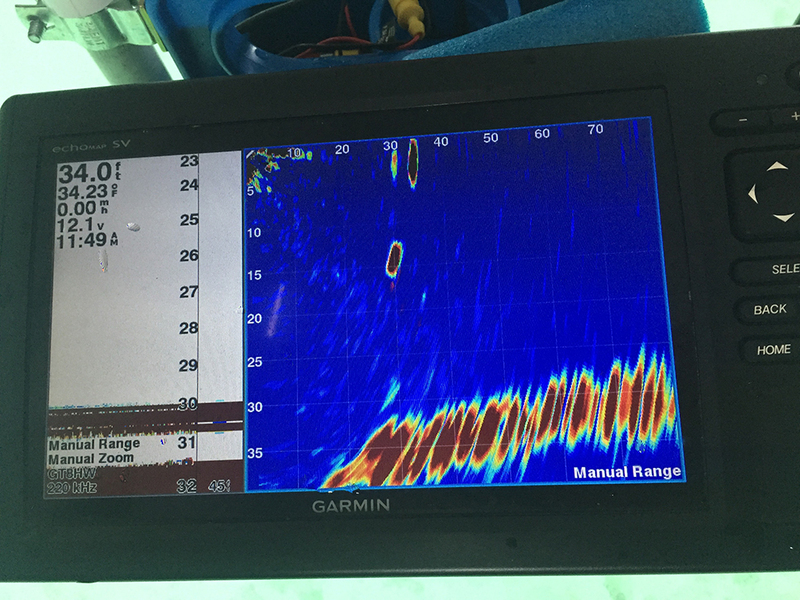 The beam angle of the Panoptix PS-22 transducer is narrow to pinpoint fish once you locate them. The first time I used Panoptix on ice we were on a lake known for big panfish. But they roamed the lake’s main basin, thus were tough to find. Fishing with Danny Thompson, we drilled holes on the west basin edge, looked for fish and – not finding any – we moved 50 yards and drilled another hole. This time we located a school of 25 or so crappie 80 feet from where we stood. “Pace off 80 feet toward that white cabin and see if you can find the fish in LiveVü Down,” Thompson said. So I paced it off, drilled a hole and dropped the Panoptix down the hole. I was directly over the fish. I remember when flashers took the ice market by storm because they allowed anglers to know if they were over fish and could watch fish respond to their presentation. The challenge with traditional down-viewing sonar is bottom coverage. A 12-degree transducer offers just 4.3 feet of cover in 20 feet of water; a 20-degree model provides just 6.7 feet at that depth. That’s why for the past three decades, ice anglers have had to cut dozens or even hundreds of holes when searching for suspended fish. Panoptix LiveVü Forward changes that. Panoptix LiveVü Down covers massive amounts of water as well. In 20 feet of water, it covers more than 20 feet of the bottom, and still provides real-time viewing and superb target separation. 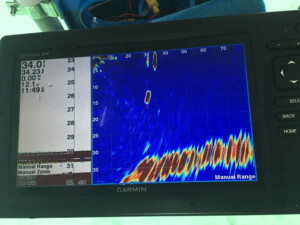 This allows you to see more fish and watch multiple lines at the same time. Fishing with Panoptix is transformative and just plain fun. 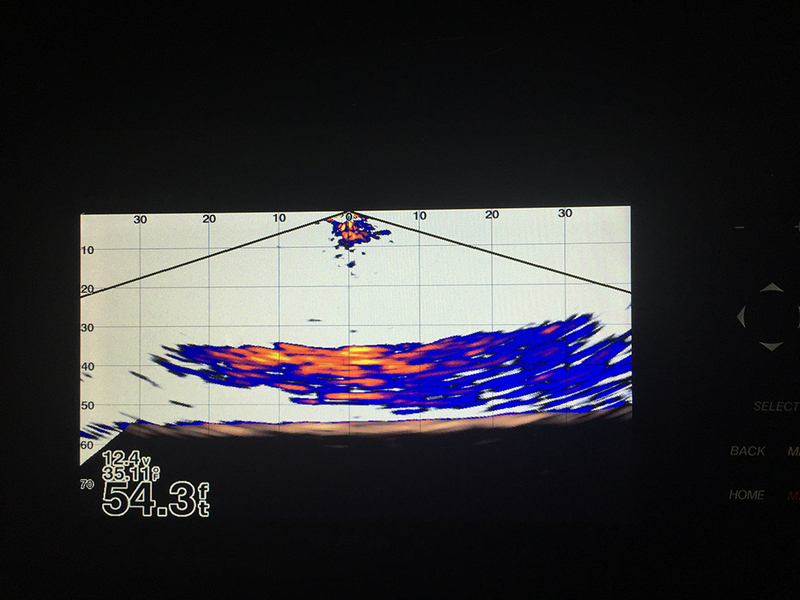 Panoptix shows you fish that are directly beneath you and those that are not responding to your presentation. By seeing more, you gather more intelligence on how to trigger strikes. That fascinates me as it represents a true breakthrough in the quest to get more bites. There’s more good news. Last summer, Garmin introduced Panoptix LiveScope at the ICAST Trade Show in Orlando, Fla., where it won Best of Show honors. LiveScope offers both Down and Forward views like original Panoptix, but with even greater detail than Panoptix. The first time I used LiveScope on ice, I was stunned at the detail it provided. I could count the individual fish in a school of perch, and even tell relative size of each. And when a big pike appeared on the screen, I could see the shape of the entire fish. Neither Panoptix or Panoptix LiveScope are inexpensive. The Panoptix ice bundle, if you can find one, retails for $1,899 and the LiveScope runs $1,499 plus sonar unit and Garmin Ice Kit. What many anglers realize, however, is these units are not just dedicated ice units, but provide the same performance in open water, which means buying just one unit for both seasons – and that makes pricing more attractive. Steve Pennaz is a Freshwater Fishing Hall of Fame angler who hails from Independence, Minn.